Gaston Boca was "a highly-qualified engineer" with a degree from one of France's top schools, École Centrale, who was the assistant director of a factory in "the dreary Paris suburb of Nanterre," but during his obligatory military service, Boca produced four detective novels during the 1930s – making him one "the great French pioneers of the genre." Celebrated anthologist and locked room expert, Roland Lacourbe, praised Boca's work as "brilliant variations on our favourite theme." Namely the impossible crime story. 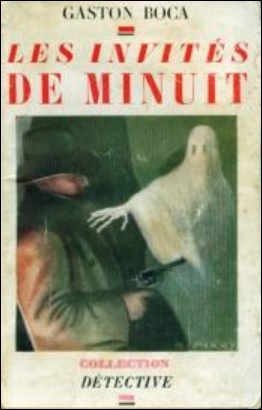 Les invités de minuit (The Seventh Guest, 1935) is the last of three mystery novels about Stéphane Triel, "a collector of tragic trifles," who previously appeared with his confident, Luc Dutheil, in L'ombre sur le jardin (The Shadow Over the Garden, 1933) and Les usines de l'effroi (The Terror Factories, 1934). 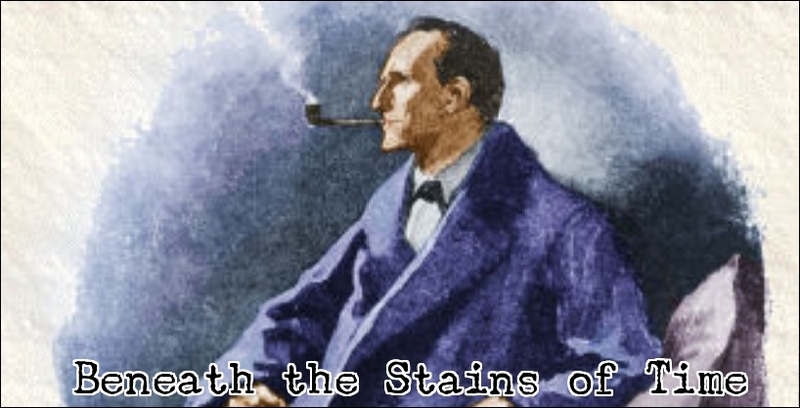 The introduction notes Triel seems closer to Gaston Leroux's Joseph Rouletabille than to Conan Doyle's Sherlock Holmes, but personally, I couldn't see either Rouletabille or Holmes in him. As clueless as he may be, Dutheil had become a very unconventional, Watson-like figure by the end of the story. So any kind of resemblance to these characters are purely superficial, but what about the plot, you ask? Pugmire wrote in his introduction, entitled "The French Golden Age," he had seldom read "a more monstrous and intricate plot," which is perhaps laying it on a little bit too thick, but the elaborate plot with its enclosed setting has all the qualities of a Japanese puzzle box with a bundle of impossible crime material locked inside – all of which are used to great effect by Boca for the story. And it all began with an invitation from a stranger. A letter summons Triel and Dutheil to the French home of René and Jeanne d'Arlon, Nanteuil Manor, near Marley, Seine-et-Oise, but nobody answered the doorbell when they arrive. Smoke is coming out of the chimney of the concierge's lodge and a pot of potatoes was bubbling on the stove in the kitchen, but "Sleeping Beauty's castle" appeared abandoned until they hear a woman's cry. These cries lead them to a small wood cabin at the edge of a clearing with a track of large prints of clogs, "sunk deep, already half full of water," going up to the front door, but they don't come back. Upon entering the cabin, they find the body of a large, heavy man hanging at the end of a rope. The victim is the nephew of the manor's concierge, Benoît Gérapin, who disappeared the previous night and appears to have taken his own life in the wood cabin. There was only a single line of clog-prints leading to the cabin door and to hang someone as heavy as Gérapin above his own height would require "an entire team of executioners," but there are anomalies suggesting a different story – such as lipstick on the victim's mouth. But they'll soon discover that nothing is really what it seems at Nanteuil Manor. I have to repeat a warning here from Pugmire's introduction: Boca had "a distinct preference for strings of sentences" creating "a stream-of-consciousness effect," which takes three or four chapters to get use to. And the steady increase in character dialogue also helped smooth this out in subsequent chapters. However, it does make it a difficult story to review. Anyway, back to the story. Shortly after the body is discovered, Jeanne confides in Triel that the estate has always inspired in her an indefinable, baseless feeling of fear and she decided to call on them for help when she learned they had manage to solve "a strange case" in "a little village on the Somme." Now that a tragedy had occurred, Triel and Dutheil discover first hand that Nanteuil Manor is place that's hard to leave. The manor has a large park "surrounded by insurmountable wall" with black doors "as impregnable as a tombstone," which turn out to be securely locked when try to leave and they become the prisoners of an invisible presence during the night. An invisible presence who performs a number of nifty parlor tricks! Arguably, the most memorable and effectively used impossibility happens when Inspector Troubert, who had been called in by René d'Arlon, offers a toast to all of the Nanteuil guests, "visible or invisible," when they hear three distinct knocks on a bedroom door – which slowly started to open. Only nobody appeared in the doorway. So they decided to take a look, but the bedroom was empty and only two means of egress, apart from the connecting door they had come through, was "a shuttered window and a sealed arched doorway." And both had been latched or bolted from the inside. Another inexplicable situation occurs, in the same room, when "a bundle of old rags" is thrown into the room, from the direction of the sealed doorway, which extinguished the chandelier. Once again, nobody was standing there and the door remained securely bolted. This time, Triel took a shot at the invisible guest and, whoever it was, left a drop of blood, but how? 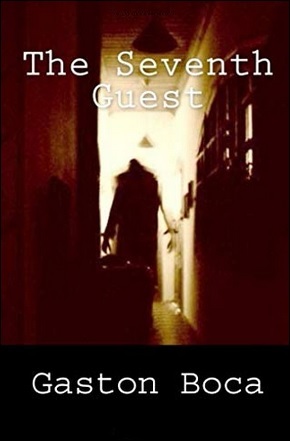 The Seventh Guest is a nice treat for the avid locked room reader, however, the impossibilities here are simply cogs in the greater machine of the plot and the who, as well as the why, were actually much more interesting than the various impossible problems. And coming from me, that's saying something. I very much enjoyed the locked room trickery pulled by the invisible guest, but the primary impossible crime, in the wood cabin, could have been a resounding disappointment had it not been for the excellent handling of the situation and murderer's identity – making it perfectly acceptable. Not to mention the grim, but well-imagined, back-story that lead to this murder and that unforgettable night at the manor house with an invisible house guest. In spite of its conventional exterior, The Seventh Guest is a dark, well-imagined, compelling and, above all, a mostly original detective novel with an ending that went down a path rarely taken by Boca's contemporaries. The result is a fine and memorable addition to Locked Room International's growing catalog of impossible crime fiction. I'll continue to linger in the international scene of non-English traditional detective stories with a rare, little-known shin honkaku novel from Japan. So stay tuned! Trust the French to come up with an unconventional way to take on a conventional story-form, eh? After the three Noel Vindry novels LRI hve put out and my limited exposure to Boileau-Narcejac I'd be disappointed if this was simply another country house murder...and you certainly make it sound anything but that! I have this ready to go when I'm in the mood for something a little left-of-centre, and it sounds like that's exactly what I'll be getting. Wonderful! You've convinced me; I'll move it to the top of my TBR pile.